LINTHICUM – Assessing the significance of 3-D printers as a learning tool in every Archdiocese of Baltimore elementary and high school, Dee Kerr minced no words. “This is truly the most exciting, cutting-edge project that’s going on in the United States, and it’s right here in the Archdiocese of Baltimore,” said Kerr, CEO of STEAMtrax, which will help schools implement the printers as part of a STEAM (science, technology, engineering, arts and math) curriculum. A 3-D printer adds successive layers of material to make a three-dimensional object, such as a prosthetic limb or replacement part for the International Space Station. The archdiocese’s 3-D printers – a total cost of $250,000 – were made possible by the Embracing Our Mission – Shaping Our Future capital campaign, which raised $50 million for archdiocesan schools through parishioners’ donations across the archdiocese. “Thanks to all of you, wherever you may be,” the archbishop said. Thirteen elementary schools were scheduled to receive their printers within the week, including Holy Angels Catholic School in Baltimore, an elementary school drawing a third of its students from the city’s Sandtown-Winchester neighborhood, which bore the brunt of the April 27 rioting that occurred soon after the funeral of Freddie Gray Jr, who had lived in the neighborhood. 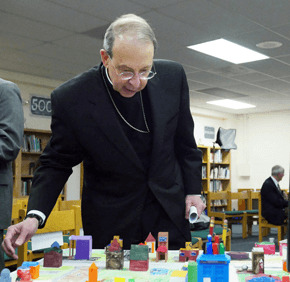 “We saw in the past few weeks just how important it is that every child in our community be given hope, and that every child in our community be given opportunity,” Archbishop Lori said. “And we believe – and I still believe passionately – that the most effective way our Catholic schools can instill and inspire hope for a child’s future is through an outstanding, academically-excellent, faith-based education taught in a safe and nurturing environment. Kathleen Filippelli, principal of Holy Angels, said her students are “already excited” about using the 3-D printer. Though her school has a STEAM program in place, the printer represents “another step we couldn’t have afforded on our own,” she said, adding that Holy Angels will integrate the printer into both classroom learning and afterschool activities. Philip Lathroum, computer and music instructor at St. Philip Neri, which has been utilizing a 3-D printer in the classroom for some time, said that the cutting-edge technology captures his students’ attention to a level well beyond what can be reached with “paper and pencil” learning methods. “These kids are into technology,” Lathroum said, noting that many of them have smart phones and tablets, which are not allowed in school. “We’re kind of giving them something back, but it’s cooler than what they have at home,” he added, as his third-grade students sat focused at computers, using Tinkercad software to design vehicles to be printed later. Carla Vega-Diaz, an eighth-grade student at St. Philip Neri, said that she felt “lucky” to have the opportunity to use a 3-D printer. “Personally, I find 3-D printing interesting because of the advances it has made in the medical field, which is the field I want to enter when I grow up,” she said. 3D Systems Corporation is partnering with the archdiocese to supply the printers. Neal Orringer, vice president of 3-D Systems, noted that 3-D printing “launched a revolution” when it was invented in 1983 by 3D Systems co-founder Chuck Hull.